You are dedicated to living a fit life, but your work-family life schedule permits you to workout at 9:30 p.m, or let’s say at 1 a.m. Would you go that late if you had a place that was open? If you said yes to either/or, there is a gym for you and your schedule. Workout ANYTIME is a 365-day, 24/7 gym. Located in the shopping center by Winn-Dixie on Knight Boxx Road and Blanding Boulevard, the 8500-square foot space studio that specializes in convenience, the latest equipment and modern social features to keep you fit. “Our philosophy works well for everyone. It’s low cost. You don’t get a big box feel. Our equipment is new, and we are opened all the time, “ said franchise owner Blake Odom. Odom owns several other Workout ANYTIME clubs in the Jacksonville area including the Oakleaf Plantation studio which opened in 2015. 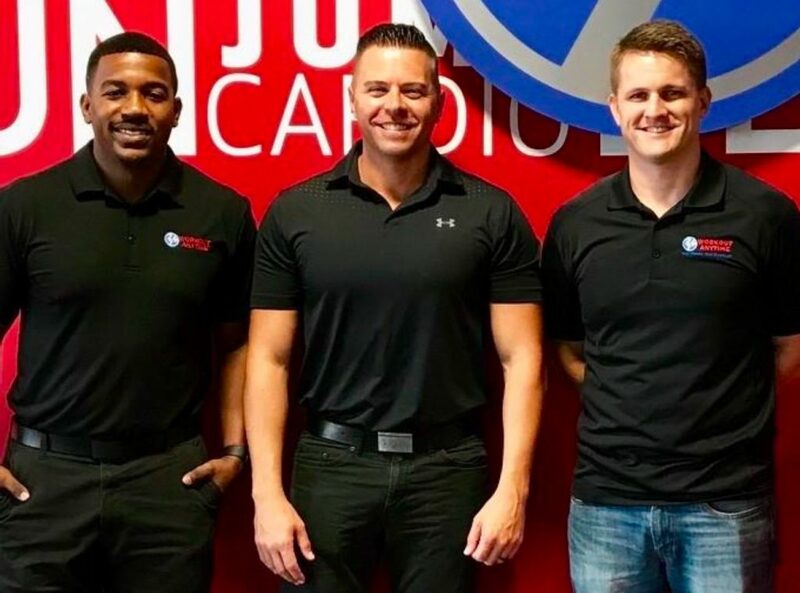 Odom has an extensive background in the fitness industry from a personal trainer to a regional vice president for Lifestyle Fitness, which used to be in the old unoccupied building on Wells Road. Over the past couple years Clay County has seen a steady increase in gyms and fitness opportunities. Also, we are ranked No, 1 of the Top Ten healthiest counties in Florida this past year. Good job Clay residents for showing more interest in getting fit! Since Workout gyms are always open, conveniently located with plenty of parking, you have more choices than excuses. Come before or after work, during lunch, before picking up the kids, or in middle of the night. Connect to Wi-Fi and choose your favorite tunes, read an online book or watch a TV show. Gyms are staffed during regular business hours and at other times, you access the gym with a personal key card. Monthly fees range from $15 to $25 depending on what level of program you desire. Further, there are three certified personal trainers on staff and a small group functional training group called MX4. The bottom line is you have a place that meets your fit life needs – lose weight, build strength, increase energy on your own time. One of the first impressions I noticed was the crisp, clean environment, padded flooring, and brand new uniformed equipment. Workout ANYTIME uses Matrix Fitness machines which is one of the top fitness manufacturers. Machines include the Perfect Squat for hips and glutes, the Ab Coaster for core and stomach, and a self-spotting bench that keeps you safe while weightlifting. Besides some of the standard machines, there is: 1) a reACT machine for improved balance, coordination and core strength (a must in core stability); 2) a Styku 3D body scanner that calculates body measurements, shape, and body fat percent; 3) an Ergoline tanning bed (stand-up and lay-down); and 4) two Hydromassage units to relax muscles after a workout or a long day at work. https://workoutanytime.com/orange-park or call at (904) 900-2071, or email at orangepark(Replace this parenthesis with the @ sign)workoutanytime.com.